As of October 2018, the Ministry of Road Transport & Highways has created a new centralized website which accepts the online applications for all RTOs throughout India which provide the online facility. Firstly they will ask for holding a Learner’s Licence. Enter your Learner’s Licence Number. Enter your date of birth in DDMMYYYY format. After Filling an above Details Click on Submit. Now, Fill your Personal Details like Name, age, address. After Filling the Personal Details Now, You have to Upload Scanned Copy of required documents, like address proof, age proof, and identity proof. You should have a scanned copy of the Required documents. Upload a passport size photo or signature. Make sure you have scanned copy of photo or signature. After uploading all documents, select a date or timing for your DL appointment. Select a date and time when you are available to give a test. Now submit your payment for driving license application form, your application will be successfully sent to the RTO after the payment. Go for your DL Test a few minutes earlier on the DL Appointment Day. A driving license is an official document issued by the government of India, permitting an individual to drive a vehicle on Indian roads. This document certifies that the individual is eligible to drive or ride motorized vehicles such as a car, truck, bike, bus, etc., without any supervision. Commonly referred to as DL, a driving license specifies that you have undergone the required training and tests and are well-aware of all the traffic rules and regulations. In India, a driving license is issued by the Regional Transport Authority (RTA) or Regional Transport Office (RTO) of the state you reside in. A driving license contains a registration number and a passport size photo that gives you the identity of the owner of the vehicle. It must have a rubber stamp and the signature of the officer-in-charge along with the mention of the office it was issued from. In India, if you are learning to drive, then you should first get a learner's license after which you can get a permanent driving license. What is the Test Procedure to get a Driving Licence? To obtain a driving license in India, you are required to go through a test procedure that will test your driving skills and also your knowledge of traffic rules and regulations. An application for a permanent driving license can be filed after 30 days from the issuance of your learner’s license. The application must be filed within 180 days after the 30-day period of the learner’s license is over. Appear early for the test, at least an hour before. Submit all the relevant documents and pay the fees at the counter. You will be required to submit the test booking slip if you have booked an appointment online. Different states have different test procedures. The test will be conducted in the presence of a Motor Vehicle Inspector. Usually, you will have to undergo a ‘Forward 8 shaped track test’, ‘Parallel Parking test’, or ‘Reverse S Test’ or ‘Drive backward on S-shaped track’. For a two-wheeler test, you should ensure that your feet do not touch the ground, while for car test, you should make use of rear-view mirrors, use proper hand signals and shift gears smoothly. You will also have to undergo a written test where you will be asked questions related to traffic rules and regulations. If you are applying for driving license online, then the written test will be conducted online. On passing both the exams, you will be handed over a receipt which will be your driving license for the time being until you don’t receive your driving license copy by speed post. 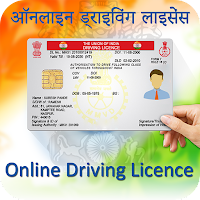 So, Hope you Find this Apply Online Driving Licence in India Article Helpful comment your queries about the topic.